I am Kristy from The Diary of DavesWife. I am thrilled to be here at Tatertots & Jello today and share with you a Delicious Recipe for my Favorite Hot Chocolate – Red Velvet Hot Chocolate. If there is one thing that you should know about me, it’s that I love the color Red and I have a SERIOUS obsession with ALL things polka dot. So as you can imagine, when it comes to sweet treats, Red Velvet is my absolute favorite. And this Red Velvet Hot Chocolate does not disappoint! It’s rich, creamy, and chocolatey and with the right amount of red food dye, it gives it the perfect Red Velvet taste! 10 ounces of coarsely chopped Semi Sweet Baking Chocolate. First Start by Warming up 4 Cups of Whole Milk & 1/4 Cup of Granulated Sugar in a Medium Saucepan. Bring to a simmer and whisk until Sugar is Dissolved. Remove from heat and Whisk in 10 ounces of coarsely chopped Semi Sweet Baking Chocolate. tsp of McCormick Red Food Coloring, and 1 tsp of Vanilla Extract. Pour into your favorite mug and top with Whipped Cream. There is nothing like a Warm Cup of Creamy, Dreamy Red Velvet Hot Chocolate on a Cold Winter Night! Once all the chocolate has melted and incorporated into the milk, whisk in 2 tsp of McCormick Red Food Coloring, and 1 tsp of Vanilla Extract. Thanks Kristy!! Red Velvet Hot Chocolate sounds too good to be true!! Kristy has such fun ideas on her blog, The Diary of DavesWife. Like Kristy said, she has a serious obsession with polka dots! Look how amazing her KitchenAid mixer turned out when she gave it a little polka dot love. These White Chocolate Peppermint Chunk Cookies look SO yummy!! And she gave her entryway a darling facelift by adding this DIY Pelmet Box! 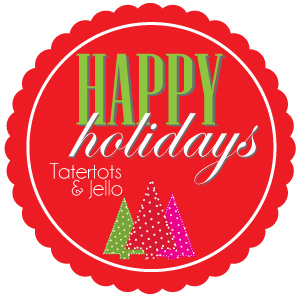 4th Annual Tatertots & Jello Holiday Cookie Exchange!! Thanks for the amazing recipe Kristy! You had me at red velvet! You found a way to turn my favorite dessert into a drink!